This post is about English/Italian word pairs that have a common etymological origin (cognates) where in each pair the English word starts with the letter H and in Italian letter does not. For English speakers learning Italian, encountering these words in Italian can seem rather odd on first encounter. Before jumping to the list, take a look at how the the letter H works in Italian and English. With the verb avere (“to have”) in the present tense to avoid confusion with other common words. ho (first person singular “I have”); without the H it could be confused with o, which is the conjunction “or”. hai (second person singular “you have”); without the H it could be confused with ai, which is the articulated preposition meaning “to the”, “with the”, etc. ha (third person singular “he has”); without the H it could be confused with a, which is the simple preposition “a” meaning “to”, “at”, etc. hanno (third person plural “they have”); without the H it could be confused with anno, which is the noun “year”. To modify the letter pairs ch or gh and indicate that they should be pronounced as a hard C or G when followed by the letters E or I.
gioco "game" (soft co as in the sound “cooperate”) and giochi (hard chi as in the sound “key”). ago "needle" (soft go as in the sound "go") and aghi (hard ghi as in the sound "reggae"). Short interjections, where it has no sound value but helps avoid confusion with other words and or reinforces the emphatic nature of the interjection. Examples include: Oh! – “Oh!”, Ehi! – “Hey!”, Beh! – “Well!”, Boh! – “I don’t know”, Toh! – “Oh!”, Ehm! – “Ahem! Um!”, Ahimè – "Alas! Dear me! ", Ohimè – "Oh dear!" The H not having a sound in Italian means that Italian mother tongue speakers speaking English often have some difficulty in knowing when and how to use an H. There is the often cited example when an Italian says what sounds like “I’m angry” when they mean “I’m hungry”, or vice versa. For every H under or over-corrected by an Italian speaking English, there is an English speaker (like us) not rolling Rs enough, clearly pronouncing double consonants, or getting the stressed syllable correct. For examples of the latter, see Italian Words with Tonic Stress on Third-From-Last Syllable: Le Parole Sdrucciole. In English, the letter H is either silent or a voiceless glottal fricative. The latter means that it is a wannabe consonant but not quite. Think of it as a breathy consonant. The letter H is spelled aitch or sometimes haitch, but using the second spelling might be considered a bit gauche and you might get labeled an h-adder. The question of the letter H is more complicated that I ever imagined in English. Some English words borrowed from French like honest, hour and herb have a silent H. Others from French have come to have a pronounced H like horrible, hospital and humo(u)r.
In this post we are limiting ourselves to just talking about H starting a word. But what about if the letter H is in the middle of the word? Seems it can be silent (messiah, rhapsody, shepherd, exhaust) or voiced as well (behind, perhaps, behavior). Have you ever stopped and wondered about whether to use “a” or “an” before a word that starts with the letter H? You are not alone! A history book or an history book? A historian’s view or an historian’s view? Some advice suggests that you should use an indefinite article before a word starting with H if it has a vowel sound, regardless of how it is written. In this case, it would be “a history book” and “a historian’s view”. Another reference (scroll down) suggests a more nuanced and correct approach – we believe – where you take in account where the stress is in the word. History is stressed on the syllable with the letter H while historian is stressed on the second syllable that doesn’t contain the H. In first case, the H is more pronounced and in the second case it is less pronounced and almost absent thereby almost equal to a word starting with a vowel sound. Taking this into consideration we would write “a history book” and “an historian’s view”. This sounds better to our ears. This list is of Italian words (in italics) and their conjugates in English. The point to note is that many of the words are similar – or at least easy to puzzle out that they are referring to the same thing – but the English form has the letter H at the start of the word. In some of the cognates, it’s straightforward to pronounce the Italian word. An example is horrible mapping to orribile (but be careful to pronounce that last e in the Italian version). In other cognates, it gets a little trickier because spelling changes subtlety like an I becomes a Y. 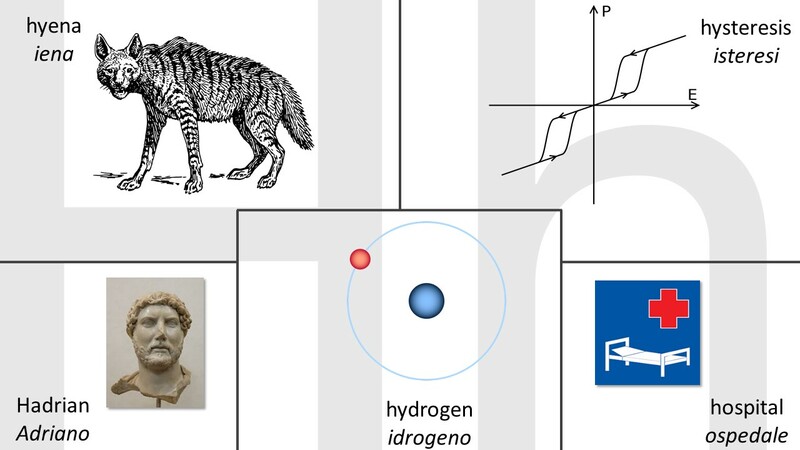 An example is hydrogen mapping to idrogeno. In the following list of pairs, the Italian word is given first followed by the English word. Many of these words have a third-from-last syllable stress. For more on that subject, see Italian Words with Tonic Stress on Third-From-Last Syllable: Le Parole Sdrucciole. This list includes geographical names. But note that while Haiti and Honduras don’t drop the H in Italian, Hungary does and becomes Ungheria. The H is retained in Italian words derived from Latin such as habitat, herpes, and homo sapiens. Italian words that have as their base a foreign starting with H keep the H in the derived word. Examples include hegeliano (from Hegel) and haitiano (from Haiti). The retained H in the above list is a reminder to aspirate (burst of breath) the sound when pronouncing the word. The H is heard as more than an aspiration in only a few Italian words including harakiri and jihad.